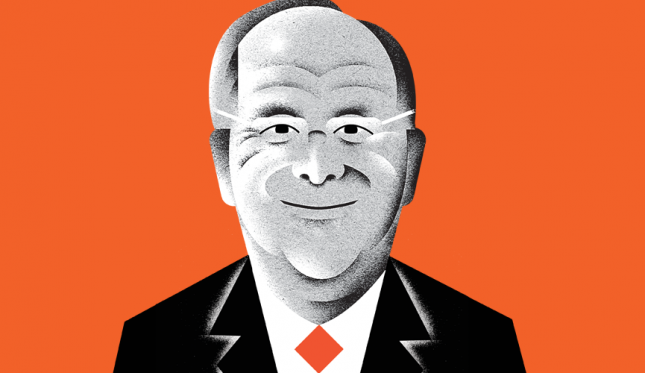 A few words with BlackRock Chairman and CEO, Laurence Fink, 2016’s most powerful person in finance. Q: Could you characterize BlackRock’s place in the financial world? A: Our position within the financial services ecosystem is because of the trust and, I would say, the simplicity of our business model. We’re not a financial services supermarket. We never wanted to be. We wanted to be good as an asset manager. When we started the firm 28 years ago with the idea that clients come first and that there’s a need for risk analytics and management, most people didn’t understand what we were talking about. Slowly but surely we built up the platform, and today our size is a validation and confirmation of that [model], because 98 percent of our earnings are based on our client-serving business. So we’re quite unique with our scale and our business model. How do you define your role, both as a leader of the firm and as a financial leader generally? So the financial crisis pushed you into a more proactive and public role? I truly believe that, because of the financial crisis and with a global distrust of financial institutions, there is a bigger responsibility for BlackRock than ever before to be a voice. Hopefully, a lot of people agree with that voice, but you need to have a voice on behalf of your clients. We have taken the responsibility as an organization to try to be thoughtful, especially in light of how regulators are trying to make sure that systemic risk is reduced. If there are going to be rules, if society wants more oversight, let’s try to make it effective without killing the golden goose. From your vantage point, there aren’t a lot of public voices out there. I would say few players in financial services have a voice today, and I do believe this is one reason why we still have distrust of financial services. The asset management business is helping people build a better financial future. That’s what it’s about. Too many people lack financial literacy or they’re truly frightened of managing their money. The fears are enormous—it took them a long time to build that nest egg. As a result you see so many investors doing the wrong thing at the wrong time. So if there are not more and stronger voices on behalf of investors, we’ll continue as an industry to be feared and possibly even hated. Do you enjoy being a voice? I certainly don’t do it because I like the visibility. I’m a very private person. But I think this is the responsibility of the CEO of BlackRock today. Speaking of public voices: In this election year, are the two candidates having a serious conversation about this country’s economic challenges? Let’s wait and see. But so far, unfortunately, the media is playing up personalities. In your mind, what would that conversation entail? I think we’re at a period of time now where the central bankers and their policies are beginning to hurt as much as they help. When we started down the path of low interest rates, it was meant to be a short-term fix as we restabilized the world and governments prepared to do more fiscal policy to reboot our economies. We’ve seen since the financial crisis an over-dependency on central banks and very little out of government in terms of assisting in fiscal policy and a growth agenda. BlackRock recently released a paper urging investors to be conscious of climate change and its effects, both pro and con, on their investments. What led you to make that move? We believe this is an opportunity for investors to focus on this, to be socially minded in how they invest. We believe we have to have a deeper conversation about this issue, and I do believe there is a need for a bigger debate on a carbon tax. We didn’t say that, but we went very close to that. At the same time, though, you have been criticized by activist groups because the firm has major investments in fossil fuel companies like ExxonMobil. Is that hypocritical? Here’s the thing I have to remind the public interest groups: This is not our money. We are entrusted by our clients to navigate their money, and what they ask us to do is to maximize return. I am not allowed, nor would I be a fiduciary, if I put my social interests in front of my clients’ desires. And this is where the confusion is. I would prefer we don’t do that [invest in fossil fuels], but if somebody gives me money that’s in an index fund, and that company’s in that index, it’s not my right to not invest in it—I would be going against my client’s desire. But we are trying to inform our clients about these things. Would you like us to screen out armaments? Carbon? We have products that can do that. What’s the most important lesson you’ve learned about power over the course of your career? I don’t think about that at all, it’s not part of who and what I am. I never think about power. It is not a word in my vocabulary. The most important thing is, I believe who and what we are today is because we earn it every day. And I believe that when you think about the word power, it’s probably time for you to retire. Finally, there’s a lot of buzz about you as a possible Treasury secretary in a Clinton administration. Would you like that job? I can play a very big role sitting here in my office on Park Avenue, and I will be here next year.